It’s the enticing aroma of fresh pastries, loaves of bread, and cupcakes with sprinkles from the bakery down the street. Now, if you’re walking by a bakery, the smell alone is likely to make you want to walk in and buy something tasty. But what if you’re nowhere near the place? How can bakery owners entice customers? 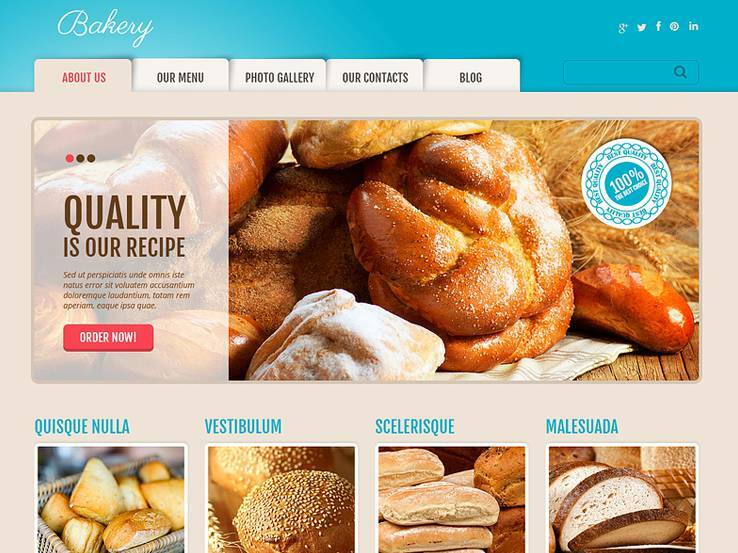 A stylish website is a good place to start and bakery WordPress themes can help with that. An online presence is essential. If someone Google’s “bakery” while out and about, you want your website to come up in the search results so they’ll pay you a visit. 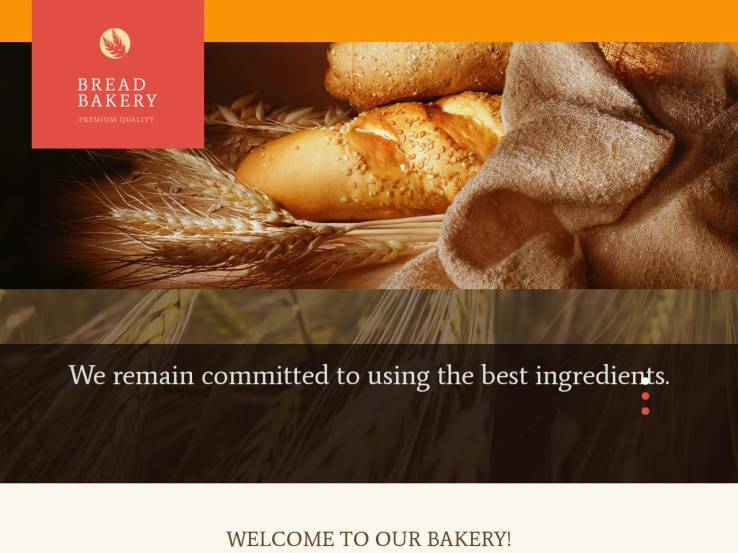 Since you want to encourage customers to visit your business, it’s essential your bakery website include information about your location and operating hours in a prominent location. You should also have a clickable phone number and perhaps integrated Google Maps for added convenience. Plenty of scrumptious-looking photos of your best cakes, cookies, and pastries, is another must. If customers can be enticed via the smell of baking bread, they can be intrigued by how good your food looks. When choosing a bakery theme, you should definitely consider choosing one with gallery features, widgets for displaying contact and location info, customization options to ensure proper branding, and support for easy setup. Most importantly, make sure any theme you choose is responsive, so your on-the-go customers can access your website from their mobile devices with ease. The Pastries WordPress theme is a great place to start your search since it provides a highly customizable interface with a responsive design that looks great on tablets and other mobile devices. 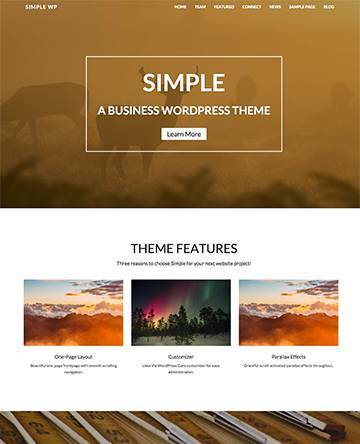 The fully editable theme is great for beginners since you don’t have to have any coding knowledge to make your site look professional. 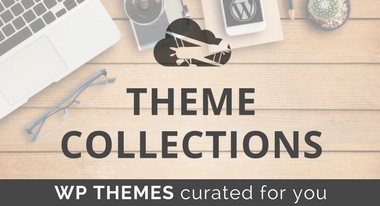 Your theme comes with custom post types and formats for creating pages that focus on anything from images to quotes. Along with plenty of shortcodes, the theme includes translation files which make it easy to translate your website into another language. What’s more? The Pastries theme comes with a two-step installation and multiple color options allow you to easily incorporate your own brand. The filterable-portfolio is a handy option for those who want to include a gallery and the fantastic sliders are ideal for showcasing new items or to inform customers abot a special promotion. The Muffin theme is a responsive theme and it includes a clean design that highlights your products and puts them into main focus. Quickly upload your logo to build brand recognition and include large images in a slider at the top of the homepage. Create a full Services page to feature what your bakery does and use the integrated blog to improve your search engine rankings and share recipes or baking tips with your target audience. The best part of the slider area is the ability to incorporate overlaying text and buttons which allow you to drive traffic to your sales pages. The Muffin theme also offers a newsletter subscription form so you can stay in touch with your customers and send them special offers. Along with widgets for social media, recipe areas, and more, the Muffin theme is one solid choice for bakeries of all shapes and sizes. 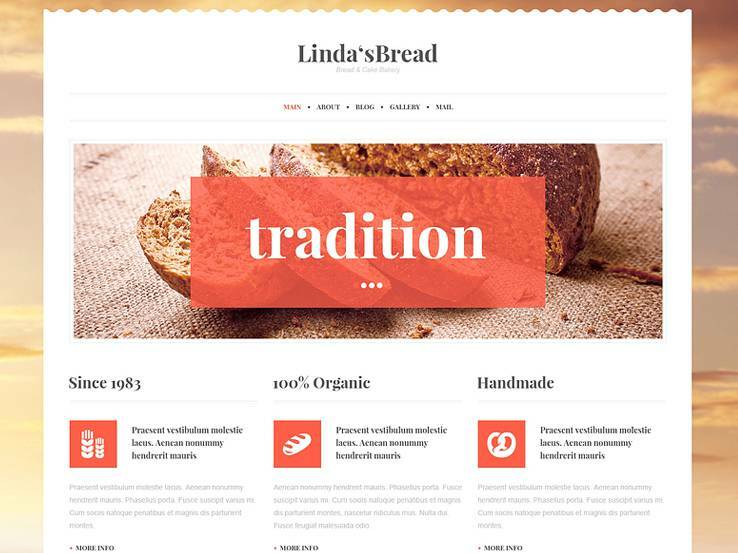 The Bakery for Saving Tradition theme has an interesting name along with some equally interesting features for powering your bakery website. 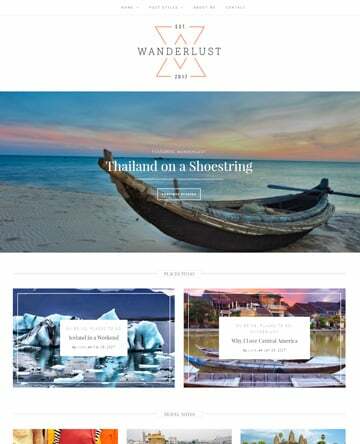 The theme is completely responsive which is great for those who want to view your site while on the go and the fully editable backend includes options for custom posts and pages. 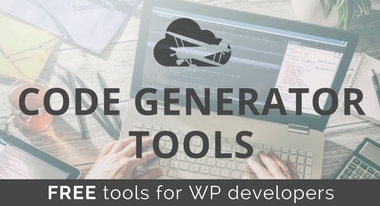 The theme also includes translation-ready features and over 80 shortcodes for making anything from buttons to columns without the need for coding knowledge. Multiple color options are a nice touch and filterable portfolio works well for those bakeries that want to feature a gallery of different pastries, cakes, and other products. Implement custom widgets for social sharing and comment boxes and use the advanced backup feature to ensure that you never lose any of your content if something goes wrong. 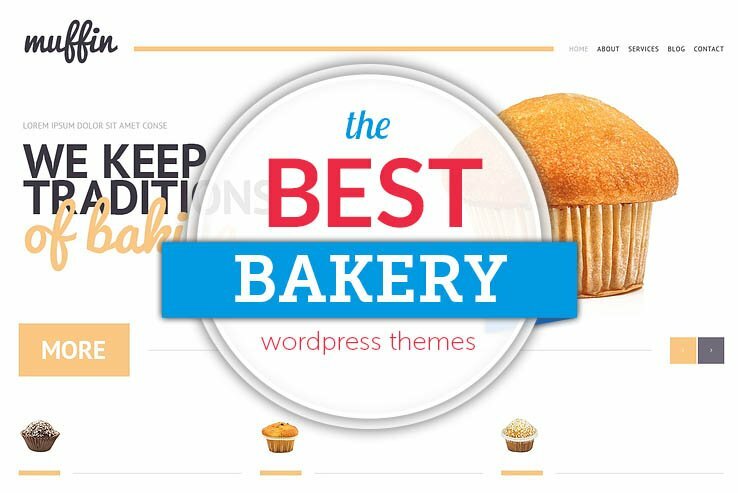 Along with custom typography provided by Google Fonts and fantastic sliders, the Bakery for Saving Tradition WordPress theme is one of the most useful themes on this list. 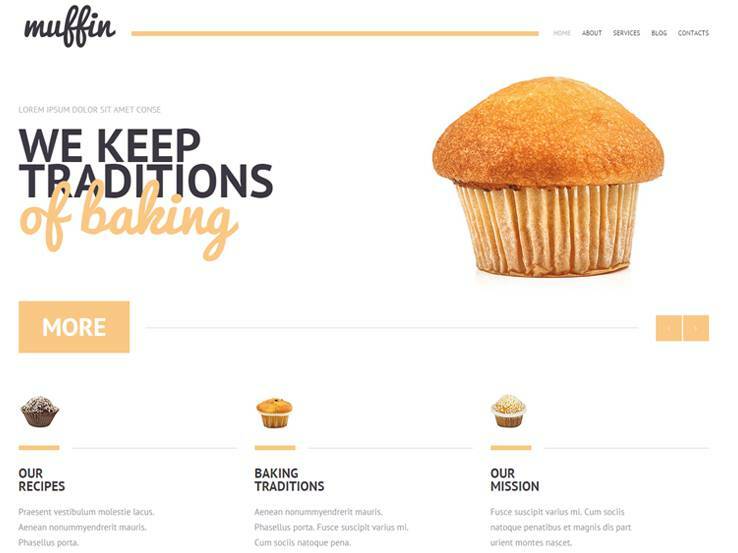 The Delicious Bakery theme has lively colors and fun elements to grab the attention of anyone who lands on your website. The responsive design has custom post types and several shortcodes which eliminate the need to touch a single line of code. As with many other TemplateMonster themes, you receive SEO support, backups, fantastic sliders, and a filterable portfolio. Use custom widgets to add social sharing and comments and try out the built-in theme customizer to modify just about anything on your website. The social media buttons can link to your own Facebook, Twitter, and Instagram pages, and they are all styled to look great with the Delicious Bakery theme. Choose from several photo gallery formats and implement your own blog for sharing bakery updates, tips, and events. Consider the Olivie theme if you’d like a somewhat feminine and clean theme for putting most of the focus on your content. The minimalist and responsive design looks wonderful on all devices, and customizable color scheme helps you implement your own brand with ease. Upload your own header logo within seconds and use the custom menu and social media icons at the top of the page to facilitate navigation and grow your social media following. The newsletter signup form connects with MailChimp and the three promo boxes are ideal for featuring your signature cake or upcoming promotions. The infinite scroll feature is unique since you can add as much content as you want without overwhelming your visitors. The theme includes a widgetized right sidebar to incorporate additional modules such as promos and subscribe forms. 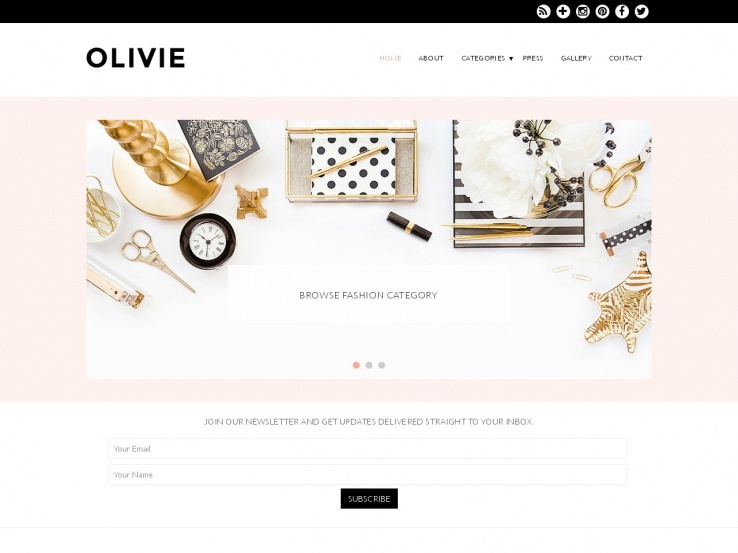 Finally, the Olivie WordPress theme offers a featured slider for your pages, posts, and categories. 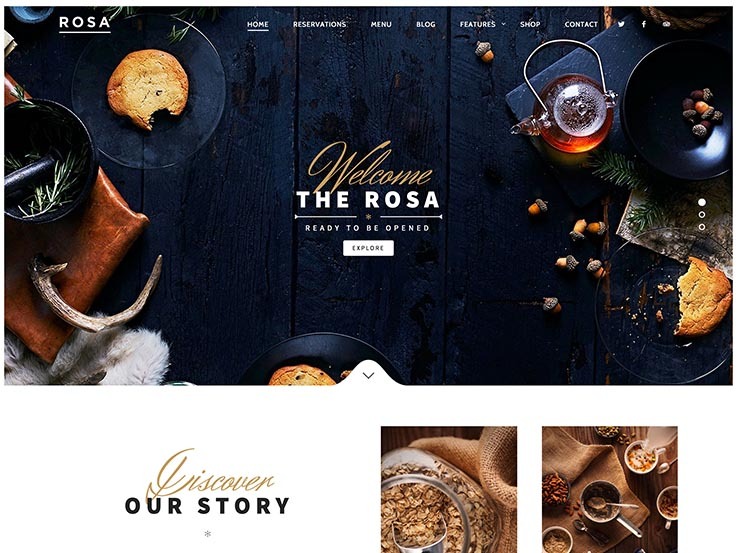 The Rosa theme is designed with restaurants in mind, but we picked it for bakeries as well because it’s packed with features that make your baked goodies look absolutely delicious. The parallax scrolling feature is a wonderful way to grab the attention and stir up curiosity about your products and the sleek products menu informs people about your prices and what types of baked goods you sell at your shop. Implement a reservations page if you take large orders and sell anything through the WooCommerce plugin support. The Rosa theme is a responsive and mobile ready theme which means your visitors can enjoy your website even when they’re using a mobile device. The notable feature of this theme is the live customizer, which means that you preview every change as you make it instead of having to push the Preview button. This is ideal for those who don’t have much development experience since you see all modifications immediately. The Wright theme is also built for restaurants, but we like it for bakeries since it has a super clean frontend interface and the header slideshow is just too good to pass up. 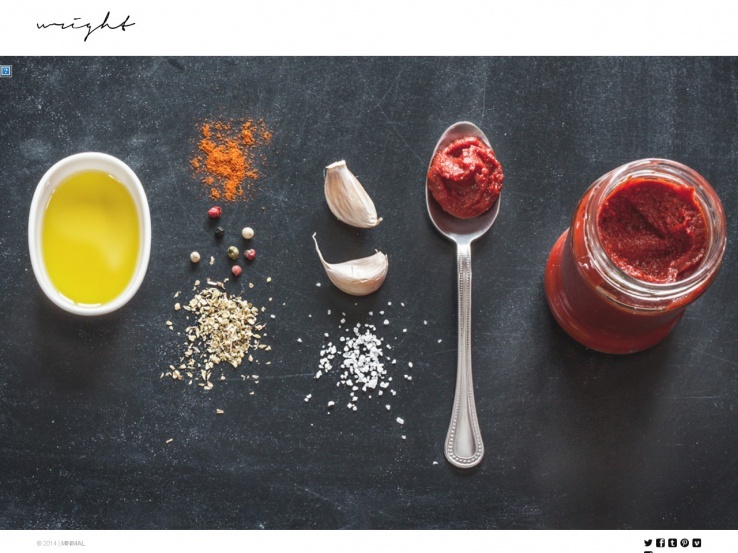 The Wright WordPress theme offers unlimited portfolios, images, and pages, as well as YouTube and Vimeo support which you can use to embed videos featuring your baking process. Google Fonts integration is an easy way to modify your fonts and image captions allow you to highlight and describe your baked goodies. It takes just a few seconds to upload your image with the Wright theme and the column shortcodes improve the layout of your site without the need for coding knowledge. 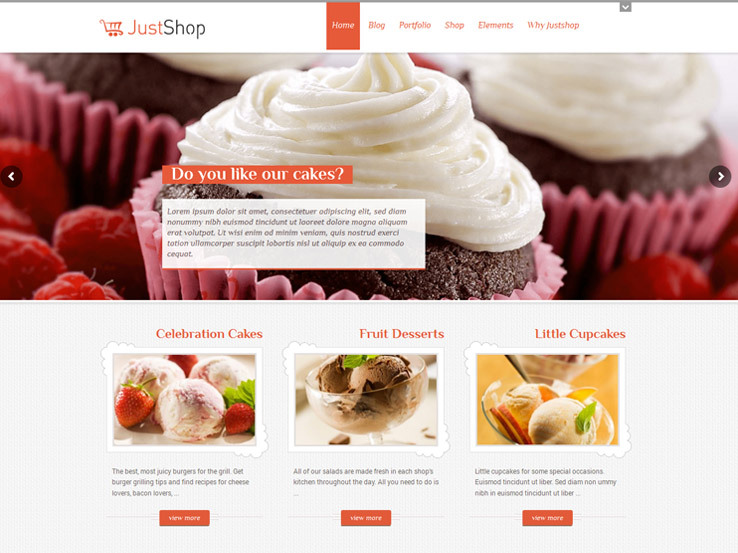 The Justshop WordPress theme offers a pleasant layout and design, which makes it a wonderful choice for bakeries of all sizes. 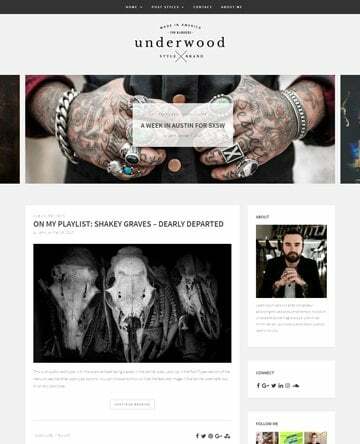 You can make the theme fully responsive and it also has settings to customize the colors and the headings. The Justshop theme is ready to work with WooCommerce, helping you sell items and merchandise online. Translations are easily made, allowing you to expand your audience reach. The drag-and-drop page builder allows you to easily customize your website without any coding knowledge. SEO optimization is built-in and you can include pricing tables to inform visitors of your prices. A menu card is also available to display all the baked goods you offer, along with the prices. Full-width and boxed layouts are both provided and you can even select your own layout or skin from a wide selection of professional designs. Finally, the Justshop WordPress theme comes with demo content to import and start your design with a little substance to it. 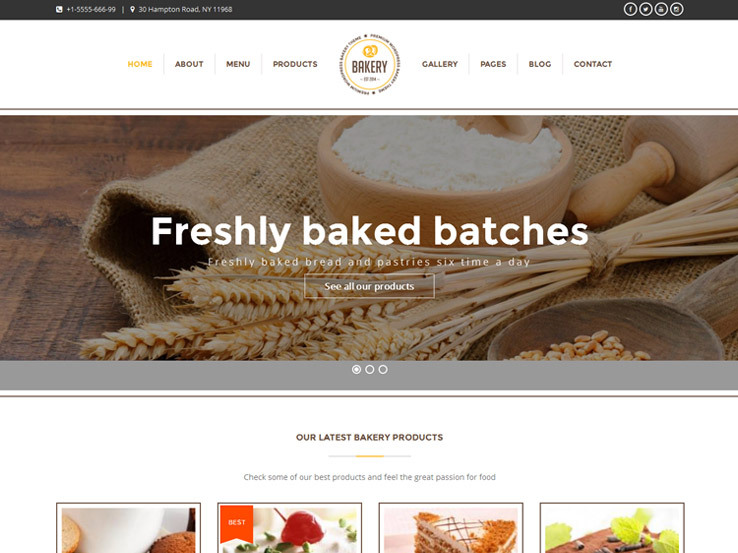 The Cafeteria theme is completely responsive and it has elegant designs for the quintessential bakery website layout. 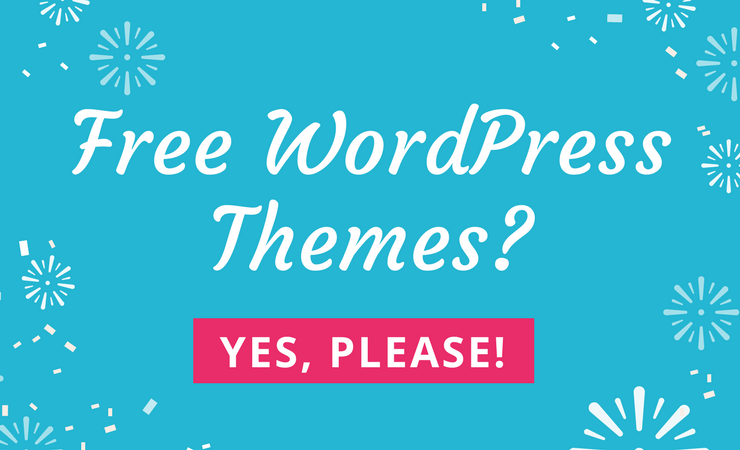 The theme options panel allows beginners to easily customize their website and over 600 fonts allow you to customize the fonts. Tons of shortcodes ensure that anyone can create items like buttons and tabs. Shortcodes not only make it easier for beginners, but they expedite the design processes for advanced developers who have several websites to work on. Localization is always a bonus, and SEO-ready code ensures your website will be easily indexed by search engines. Choose from six color schemes and use the unlimited amount of backgrounds to incorporate your own brand. The theme includes many premade templates which are easy to customize while the translation tools make it easy to translate your website. Overall, this is somewhat of a feminine style theme but it works rather well for bakeries. The theme also includes multiple gallery areas so you can showcase your products in style. The events module allows you to easily add tasting events while the header/slider area provides overlaying text and buttons to send people to your sales pages. 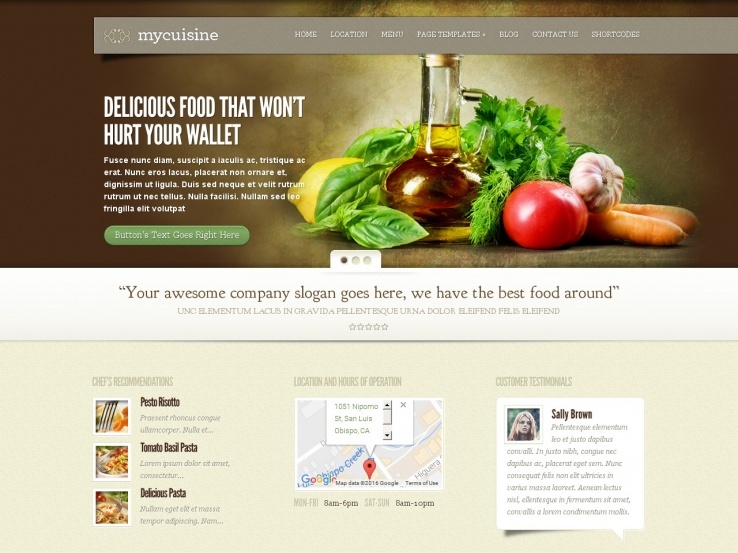 Elegant Themes presents the My Cuisine WordPress theme, which is a beautiful theme for your online presence. 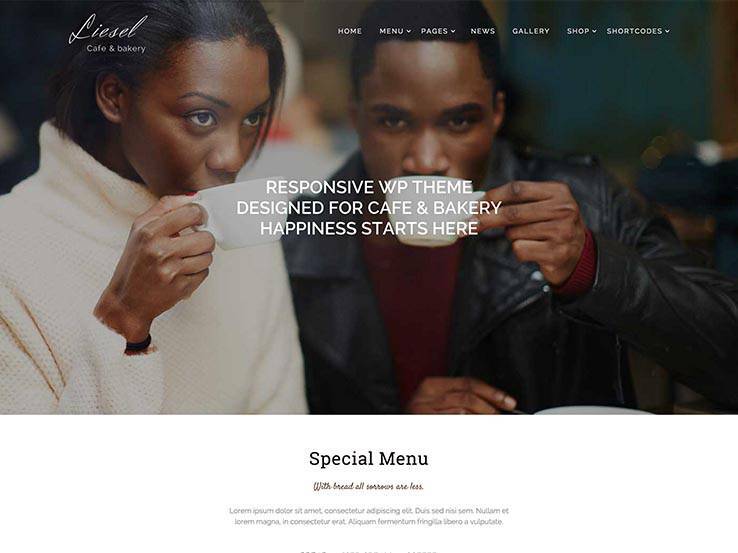 The theme offers a Tuscan-style layout, with interesting visuals that are inserted into the theme just for the food business. The menu section is ideal for sharing a list of your items, all categorized and ready for people to search through. Alternate between images and text to add variety to the menu. It’s fairly easy to create and manage your menus which is a plus for almost any bakery that regularly creates new goods. The location page template is one of the most important ones for your website because it shows people exactly where they can find you. The theme is completely responsive which is great considering many people prefer their tablets and phones to browse the Internet. You can easily translate your entire website thanks to the translation files so you can reach an international audience. You can modify your site colors to match your own branding and stand out from the competition. 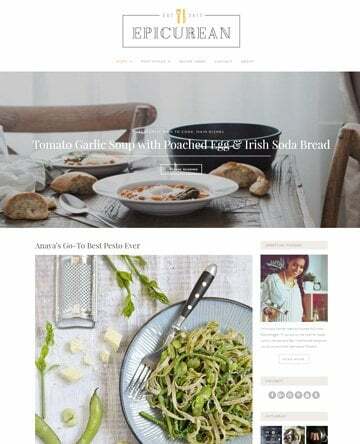 The My Cuisine theme is packed with shortcodes and page templates, speeding up your design process and providing several ways to modify your website without having to touch a single line of code. Use the beautiful slider along with a text overlay and a button to feature special products and promotions. You can also link the images to your sales pages to improve your conversion rates. 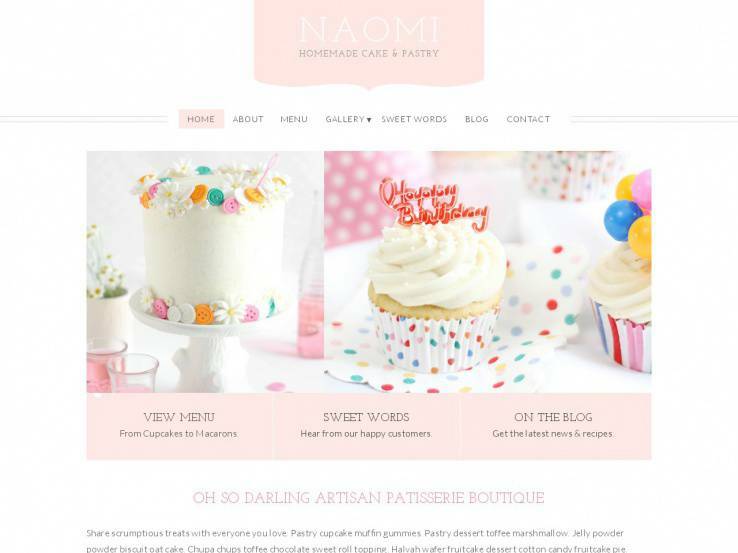 The Naomi theme by Bluchic is a great choice for the artisan boutique that specializes in cakes or pastries. The subtle colors are visually appealing, the typography is delicate and appropriate. This theme gives you plenty of opportunities to display photos of your baked goods on top of a minimalist background with plenty of white space. Other features include a responsive layout, a featured slider, three promo boxes for displaying calls-to-action, multiple layout options, a sticky menu, and more. You also get plenty of customization options including a custom logo and custom colors, plus the theme comes with full documentation and support so you’ll never be left hanging with an unanswered question. Naomi is a bakery or confectioner’s delight down to the very last detail. If you want to take the more culinary angle, the Bakery theme is a solid choice. It includes a featured slider for displaying full-width images of your sweet and savory treats and plenty of individual page sections for capturing the attention of your visitors and providing them with the information they need before paying your establishment a visit. Subtle parallax effects add visual interest, tabbed content lets you display more information about your dishes, and the retina-ready icons are bakery-specific and simultaneously adorable and helpful. 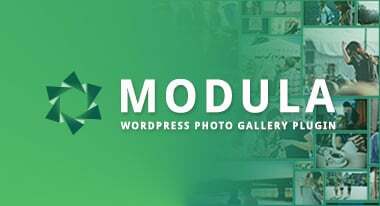 Other features include multiple page layouts, a menu (with several different layouts included), a gallery, a staff section with hover effects, testimonials or quotes, an integrated map, a contact form, and so much more. It even comes with a coming soon page. Truly, Bakery has everything you could ever need for setting up a website. 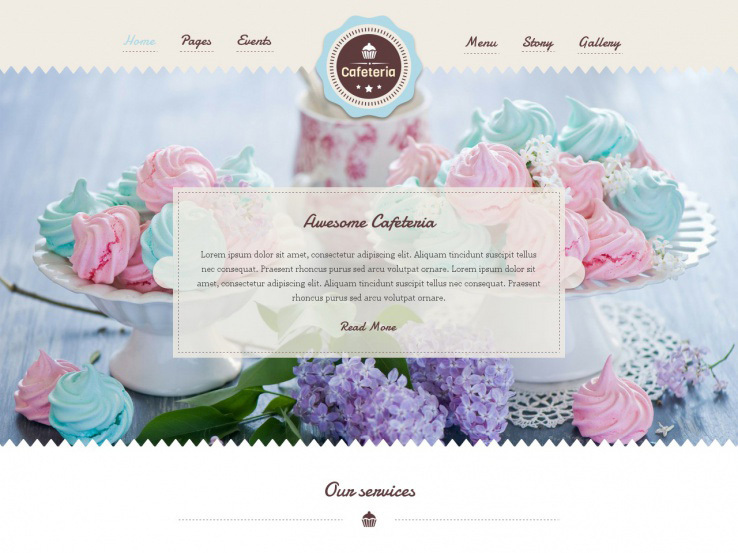 The Liesel theme is designed specifically for cafés and bakeries and includes specialized features to prove it. This theme comes with a full-width slider for displaying delightful images of your best dishes or your bakery’s interior that are overlaid with engaging text. The menu section is immediately recognizable and allows you to display a photo of the food alongside a title, description, and price. It’s also tabbed for displaying more items without making the visitor scroll forever. Other features include a testimonials section, a services section, an events section for those live music nights, a blog post widget, social icons, an operating hours widget, and more. You can also integrate your site with WooCommerce to let visitors purchase branded merchandise. A gallery, shortcodes, and multiple page layouts round out the feature selection here. What a creative idea for a roundup. I’m getting hungry just looking at the themes!